What Is DA Form 61? DA Form 61, Application for Appointment is mainly used to get an appointment as a commissioned or warrant officer in the United States Army Reserve or Regular Army, as well as to apply for attending the U.S. Army Officer Candidate School. The application - sometimes confused with the DD Form 61, Request For Nomenclature - was last revised by the Department of the Army (DA) in June 1981. 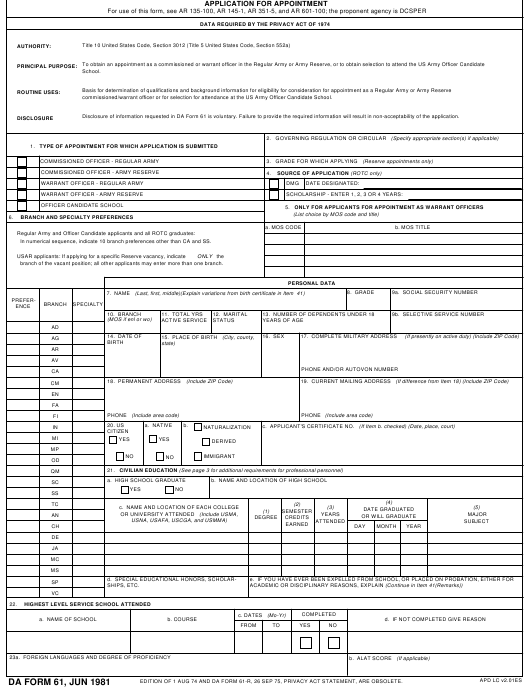 An up-to-date fillable DA Form 61 is available for digital filing and download below or can be found on the Army Publishing Directorate website. All the information in the document is used as the basis for determining the qualifications and background information on possible applicants and is provided voluntarily. If the candidate fails to disclose the necessary data, the DA 61 will not be accepted. commissioned/warrant officer or for selection for attendance at the US Army Officer Candidate School. Disclosure of information requested in DA Form 61 is voluntary. Failure to provide the required information will result in non-acceptability of the application. In numerical sequence, indicate 10 branch preferences other than CA and SS. branch of the vacant position; all other applicants may enter more than one branch. EDITION OF 1 AUG 74 AND DA FORM 61-R, 26 SEP 75, PRIVACY ACT STATEMENT, ARE OBSOLETE. 24. ARE YOU NOW, OR HAVE YOU EVER BEEN A CONSCIENTIOUS OBJECTOR? OF MY DEPENDENTS SHOULD I BE REQUIRED TO PERFORM DUTY IN AN AREA WHERE DEPENDENTS ARE NOT PERMITTED. ORDINANCE? (Exclude traffic violations involving a fine or forfeiture of $100 or less). AFFIDAVIT FORM AS TO THE OUTCOME OF EACH CASE. A POSITION WHILE IN PRIVATE OR GOVERNMENT EMPLOYMENT? (If yes, state circumstances; if more space is required, continue on separate sheet). 38. HAVE YOU BEEN EMPLOYED BY THE US ARMY AS A DIETITIAN, OCCUPATIONAL OR PHYSICAL THERAPIST? TO THE BEST OF MY KNOWLEDGE AND BELIEF. HAS NOT COMPLETED SUCCESSFULLY THE REQUIRED CAMP TRAINING. WILL NOT HAVE ATTAINED, A BACCALAUREATE DEGREE UPON SUCCESSFUL COMPLETION OF THE ROTC COURSE. OFFICER OF THE ARMY RECOMMEND HIS APPOINTMENT. DO NOT RECOMMEND THE APPLICANT. 3. REMARKS (Include your opinion as to his/her overall ability (to include leadership) and value to the service). First, the candidate needs to choose the type of appointment to which they are applying to. The appropriate number of governing regulation or circular and the applying grade for reserve appointment go in Boxes 2 and 3, respectively. ROTC applicants must fill in Box 4, Source of Application, and applicants for appointment as warrant officers need to complete Box 5. The properly qualified military may enter up to three MOS codes in the corresponding field. Box 6 requires the choice of branch specialty preferences. It is necessary to indicate at least 10 branch preferences. Male applicants are required to choose two combat support arms, two combat arms, and two combat service support arms. The remaining four are left for an applicant to choose. Females can indicate one combat arm, except IN and AR, 2 combat support arms and 2 combat service support arms. The remaining five can be chosen by an applicant. Warrant Officer Aviators who want to be commissioned have to list AV as the only choice. Boxes 7 through 20 require detailed personal information about the applicant. Boxes 21, 22 and 23 reflecting the levels of military education. The applicant should carefully read the statements in Boxes 24, 25 and 26 and tick the appropriate boxes. They must then choose and complete all following sections according to their branch of service and sign the form. The complete Army DA 61 form together with all related documents should be submitted to a unit commander. The date they receive your paperwork is considered as the application submission date.